Steve Norwood: What Do Horror Fans Want? The series continues. This time we hear from Steve Norwood. Steve is the Editor-In-Chief of the Dallas-based entertainment site, Red Carpet Crash. He’s also the Director of Programming for the Asian Film Festival of Dallas. To talk about what I want from horror cinema is to look back over decades of individual films, and to gauge how effective they were then and now. So much has changed in this one, vast, irregular genre that it’s not an easy determination to make. What has always struck me most about horror is that it works best when an overwhelming sense of dread is prized over violence or visual trickery. Darkness, the unknown, anxiety and stillness: the anticipation of the horror at hand has always been far more effective for me than seeing the actual beast, or watching a dismemberment take place. Once I was old enough to not only understand but appreciate what horror films were all about, two revolutionary classics – NIGHT OF THE LIVING DEAD (1968) and THE TEXAS CHAINSAW MASSACRE (1974) – became the milestones. And very few films have gotten anywhere close to their impact. While plenty of flesh is chewed on in NIGHT, and that titular weapon roars through much of MASSACRE’s second half, these films really work because of the terrible sense of not knowing what the hell is happening. The horror franchises of the Eighties (Jason, Freddy, Michael Myers) became less about the scare and more about the tally, and the crueler efforts of the past decade have been more about experimenting with shock than fright. For my tastes, horror touches on deeper, more personal fears, and tends to haunt rather than disgust. SESSION 9 ramps up the tension and stop until the final frame. As Anderson’s camera lingers on decrepit hallways, you begin to think that at any moment someone – or something – might step out from one of the long-emptied holding cells. It is unnerving and effective, and one of the scariest films of recent memory. Steve is the Editor-In-Chief of the Dallas-based entertainment site, Red Carpet Crash. He’s also the Director of Programming for the Asian Film Festival of Dallas. CategoriesOpinion TagsSteve Norwood, What do horror fans want? 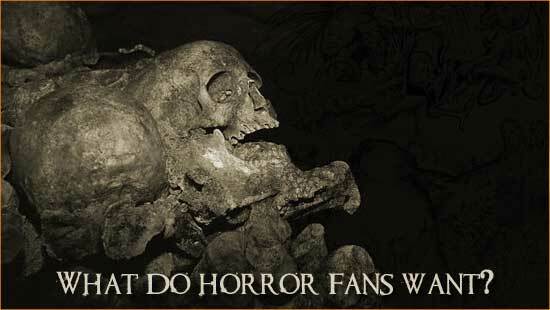 Next PostNext Jona Aldebot: What Do Horror Fans Want?